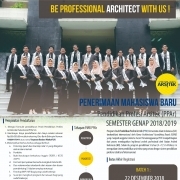 Bachelor of Professional Architect (B.P.Arch) is professional degree from Professional Program of Architect or Program Profesi Arsitek (PPAr) is fifth year program as part of 4+1 scheme in architectural education in UII. This program is acknowledged both by Indonesian Ministry of Higher Education and Research (DIKTI) and Indonesian Architect Institute (IAI). The professional program is origin from IAI’s curriculum for architect professional education in Indonesia. 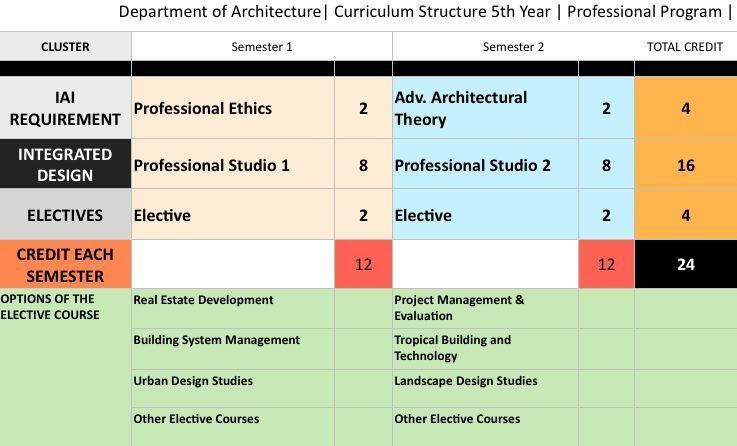 The curriculum development based on two studio based on real project cases, professional coursework decided by IAI, and electives courses to develop student expertise. 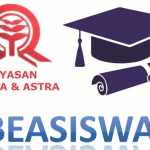 To enroll the program, student must graduated first from B.D.Arch (S.Ars) in UII with Studios grade not less than B. Our program does not accept graduate student from any other institution in order to maintain the consistency of quality. 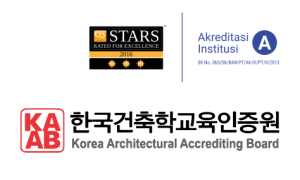 By this scheme, student will enroll and graduated completely 4+1 program which is comply with international standard according Canberra Accords via Korea Architecture Accrediting Board (KAAB). To be graduated from this 5th year program, student must finish two studios for real project designs, two professional coursework, and two elective courses. In the studio projects, student will work with an architect from an architectural firm under supervision of assigned lecturer. In the final exam, student will be assessed professionally by IAI panels of jury. If they succeeded, they will be awarded by license of ‘young architect’ or partially registered architect. For the next two years, she or he has to complete internship to obtain their fully registered architect license. For the 5th program, student will complete all the tasks within one year. Student has to finish their study maximum 2 years. Otherwise, she or he will be expelled from the program.